Except for the anchor, there are very few items that go overboard intentionally on a ship. A hat blown off your head by the wind becomes flotsam, but something deliberately discarded is jetsam. 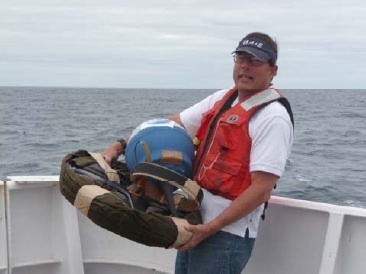 ARGO is the international program that deploys and monitors a global network of autonomous floats that monitor ocean conditions (“Taking the pulse of the oceans.”). The buoys are deployed from a variety of vessels and one of the main advantages is that a vessel does not have to slow down or stop to launch them. 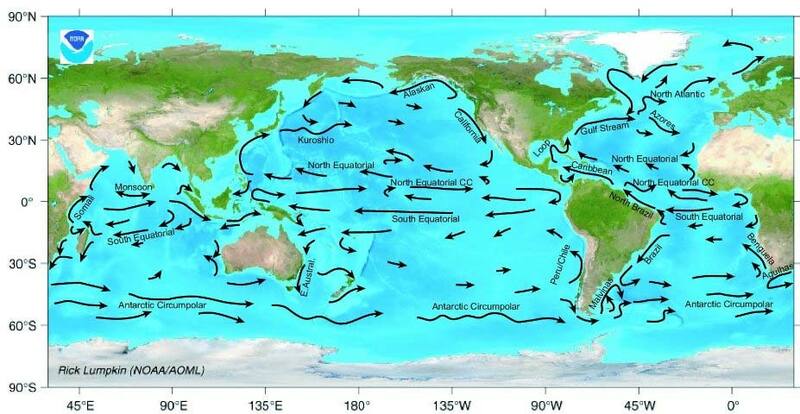 Because of this, a vessel dedicated to research is not required, and commercial and even cruise ships have participated in this world-ocean study. 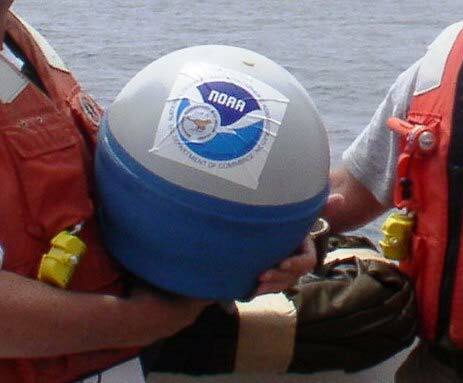 Drifters have been distributed since 1999 and continuously monitor temperature, salinity and currents. They will provide a global network spread out on a 3º by 3º ocean grid (180-miles by 180miles). Data transmitted automatically to satellites is broadcast to the Global Drifter Program and available continuously to researchers. Teachers and students also are involved through the Adopt-a-Drifter Program and we deployed drifters marked with decals from two schools partnered through it: Universite Nancy (France) and Grandview Elementary School – Grades K, 1, 2, 3, 4, 5. Drifters actively transmit data for over a year, but like anything in the sea, can become the home for bio-fouling organisms that can interfere with their operation. We deployed several of them. 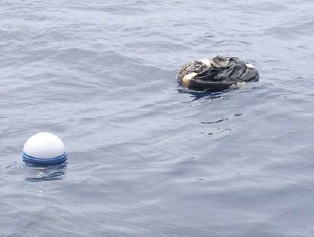 The simplest are blue-andwhite basket ball-sized floats with a drogue (a large sock-like bag) that acts as a sea anchor or drift sock so that the movement of the drifter is by current, not wind. Once in the water, the packing materials dissolve, the drogue sinks to about 15 meters, and the currents, satellites, scientists and students do the rest. 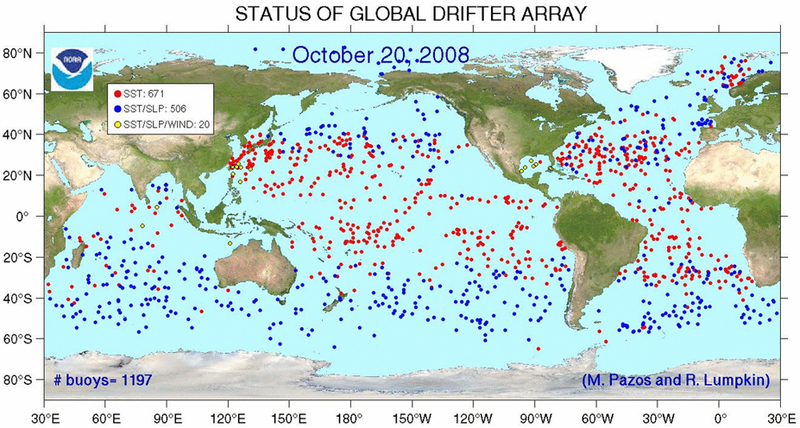 All researchers have to do to explore the oceans is log-on to the drifter website with a computer. Drifter in the water on its way! We have had a great string of days. I have settled into an interesting work routine with helpful and interesting scientists and crew. Weather balloons and sondes are released every four hours and the readouts from their fights are very informative. Along with the evening lectures, the week has been like a short semester on meteorology. Hourly water sampling has gone well too, and we are learning more about these peculiar eddies of warm and cold water each day. My roommate (RW) is very nice and accommodating, and since we work different hours and find the best way to relax is with headphones and a book, the room does not seem crowded at all. There are a few items I am glad I brought, and I suggest they be added to the TAS list: coveralls, ski cap, knee pads and eye drops. The coveralls are great for cool mornings on deck and to quickly pull on for the weekly “abandon ship” drills, since you are required to report to your muster station in long pants and sleeves, and with a hat. My light-weight volleyball knee-pads are good if I have to kneel on the metal deck for a while to take pictures. And eye drops are a relief since we do get wind almost every day, and some very bright days since we are headed into the Austral Summer, and the sun’s position is moving south every day. I have been checking my Almanac, and perhaps as early as tomorrow, our course will cross paths with the sun’s southern movement, and it will be directly overhead at Noon. This can only occur at locations in the “Tropics” (Between the Tropic of Cancer and Tropic of Capricorn) and I have heard sailors refer to it as a “Lahaina Noon.” This term comes from the old sailing days when whalers made port stops at Lahaina on Maui. When it occurs there, fence posts, and for that matter, people, do not cast a shadow. Hopefully the clouds will clear around midday and we will be able to see the phenomenon. 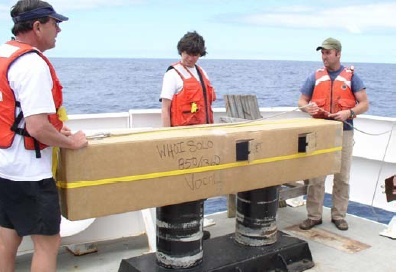 This entry was posted in 2008, Dave Grant 2008, NOAA Research, NOAA Teacher at Sea and tagged Argo, CTD, drifter array, fisheries, noaa ship ronald h brown, oceanographic processes, southeast pacific. Bookmark the permalink.